The school year is almost here! As kids prepare to work their brains, keep in mind that being a student also places great demand on their eyes. It’s always a good idea to have your student’s eyes checked at the start of a new school year. As much as 75% of learning is visually-based and students with undiagnosed vision problems often have issues with academic performance. It seems apparent that most sports require good vision for peak performance. There are an estimated 42,000 sports-related eye injuries each year and almost half of those occur in children younger than 15 years old. Proper eyewear protection is critical for many sporting activities, especially those using a ball and involving physical contact. Today’s students are staring at screens most of the day. Viewing a computer screen or mobile device places incredible demands on the visual system and can cause a variety of temporary symptoms including; headaches, eyestrain, blurry vision, neck and shoulder pain, and dry eyes. Computer Vision Syndrome is the name for vision and physical symptoms related to the use of these devices. Being a student is both a rewarding and challenging experience. 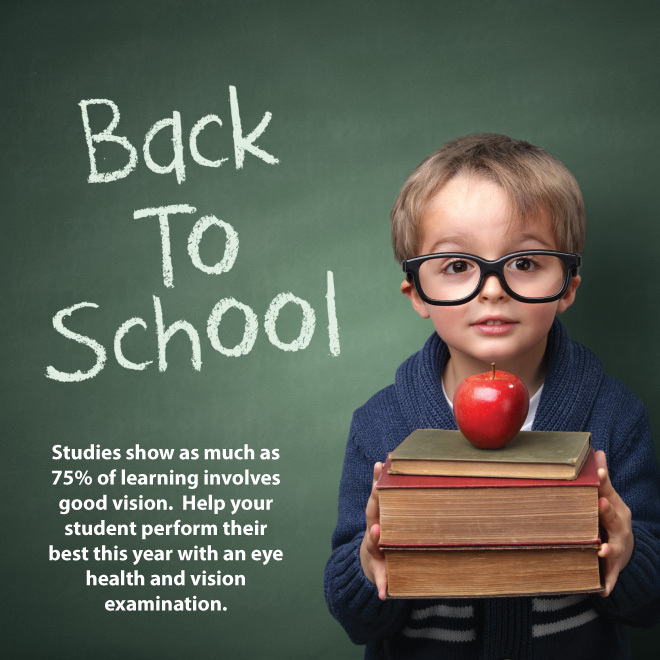 Help your student succeed this year by helping them take care of their vision.